Beautiful and scenic Arizona Road Trips that will make you want to hop in the car with the family to see everything Arizona has to offer! Over the last year, we have had fun putting together our suggestions for some of the BEST Road Trips in Arizona... and even some of the most amazing weekend trips. We also had the opportunity to visit Escanaba, Wisconsin, to see the Locks and Dams, and visit Sault St. Marie, in Michigan. We were able to see Elvis’s house in Memphis, and my Dad’s quest for more and more cars had us driving all over the Nation to tow them back for his pleasure. One thing is certain: we didn’t have DVD players or televisions in the car. We also never stopped for fast-food (my mom made sandwiches, and we stuffed ourselves at the hotel continental breakfast..). What’s ironic is that I don’t remember much fighting at all. That’s not to say we didn’t fight… we may have, and if we did, I definitely don’t remember! When David and I started having kids we thought that the best way to break in the kids for long road trips is to take lots of shorter ones. The best part is that we both love to drive and so we don’t have a problem jumping in the car at a moments notice and heading out of town. So we put together 3 of our recent family road trips in hopes that it will inspire you to take a Saturday or Sunday and jet off with your kids Pack a lunch, and head away from the Valley. There is so much to be seen, and the kids will truly enjoy every minute of it! Buckle up .. because this is a long (but gorgeous!) drive! You’ll start in Wickenburg, 60 miles west of Phoenix…. and head up Highway 89 toward the Mountains ahead. The road climbs a steep cliff with dramatic views, as it heads into Yarnell – the road levels out there as you pass by grassy grazing areas of cattle in the Peeples Valley. You’ll head back into mountain curves as you head into Prescott National Forest — hopefully you don’t get car sick from the elevation! It’s a beautiful winding mountain road that might even have some snow (depending on the time of the year!) You’ll enter into downtown Prescott, where you can grab a bite to eat before you head any further. Follow Highway 89A to Jerome – it’s not too far away but it is a treacherous climb! You will zig zag up that mountain on your way into town, clutching the side of the vehicle – if you go at just the right time of the day, you might even get to see the sun set on the beautiful rolling cliffs in Sedona in the distance. This is probably one of our favorite day trips – it’s great to take out of town visitors … head out to East Mesa on the US60, and take Exit 196 (Idaho Road). Hang a left to go north, then hang a right at Apache Trail. Goldfield Ghost Town is 4 miles, and a great place to start. Spend time time there grabbing a tour of the Mine, and a Train Ride, perhaps a bite to eat. The drive is not recommended for RV’s, and it will take you a long time to drive and view all the beautiful scenery – you might just want to stop and take a lot of pictures too! If you opt to do this day trip and want to stop at Goldfield Ghost Town, I would suggest starting around 10 a.m. After you get to Tortilla Flats, the trip on Apache Trail is best taken in daylight, and not a trip you would want to take at dusk or dark. 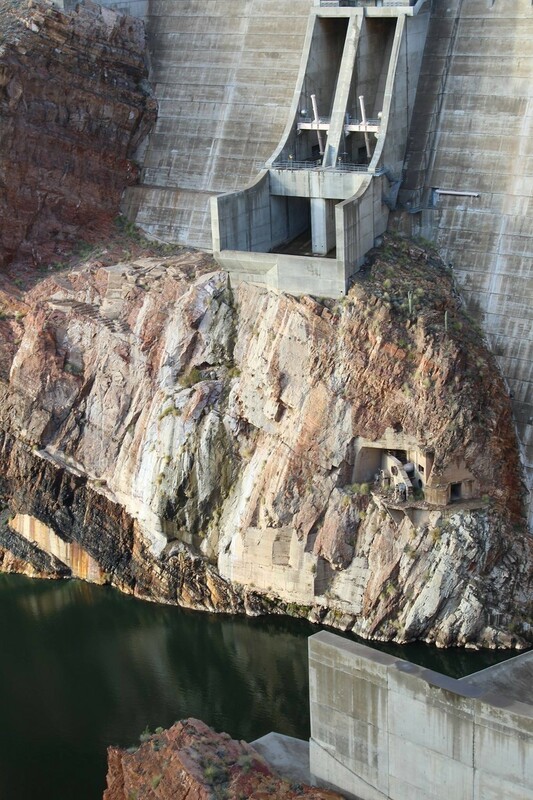 You’ll end up at Roosevelt Dam – where you can hang a right or a left. 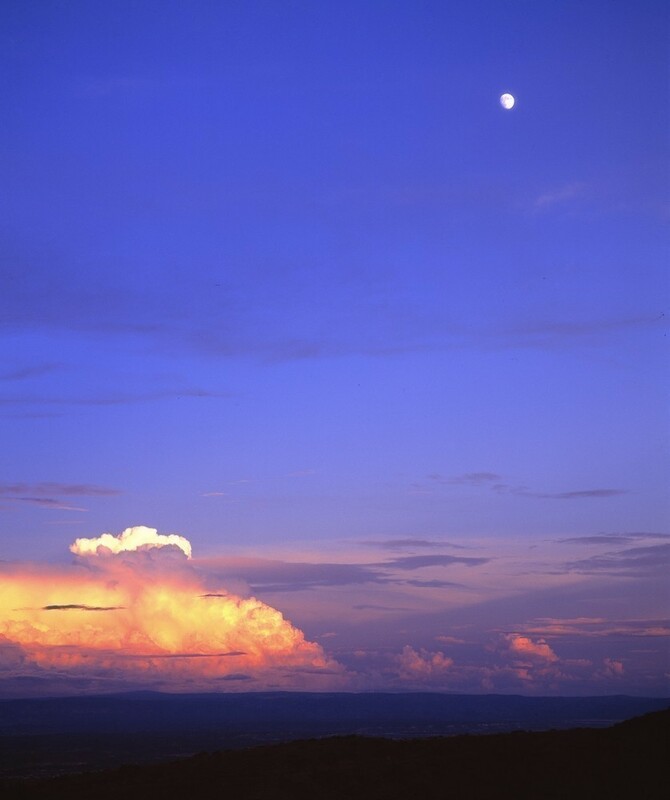 … a right will take you to Tonto National Monument… and a left will take you towards Payson. 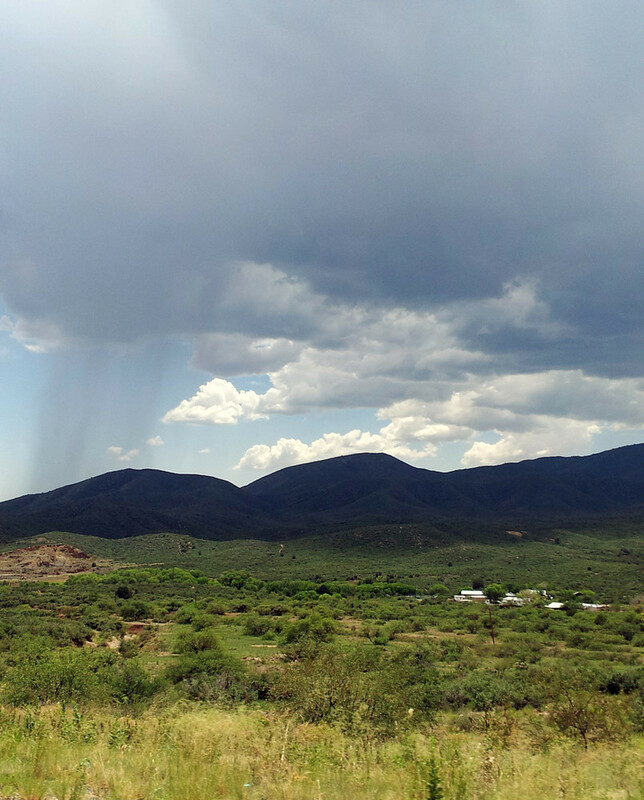 It’s a gorgeous drive – if you have small kids, it might be a good idea to bring snacks and take a potty break at Tortilla Flats before the pavement ends. You can do this is a separate day trip via the south route (2 hours each way…) or you can opt to go after the long trip through Apache Trail (#2 – above). I will say though that if you choose to make the Apache Trail trip and take the long route, then leave early – because you will want to see the Tonto National Monument after lunch but not too late in the day. 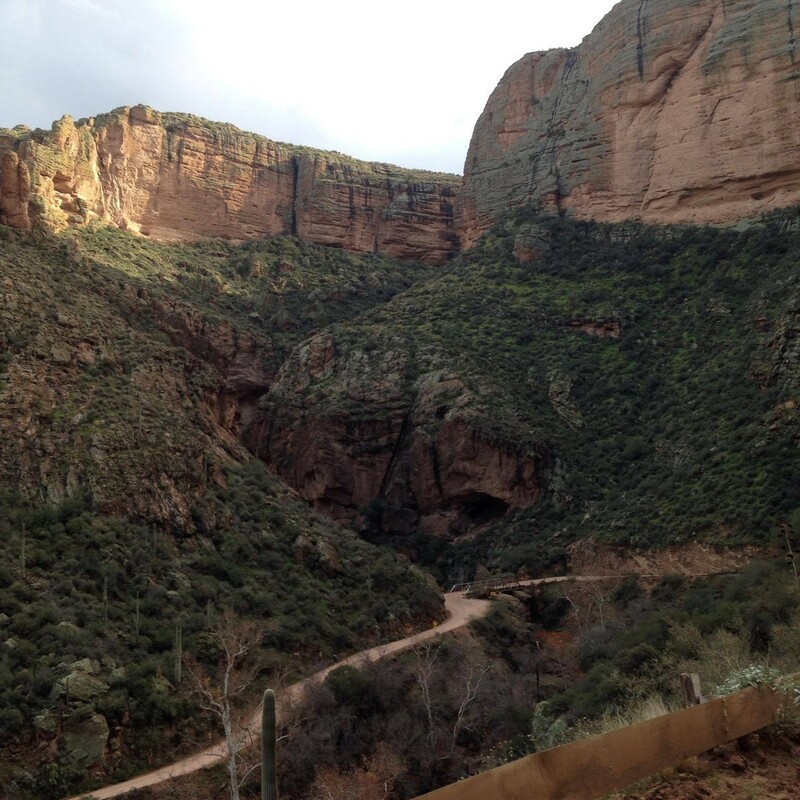 The 1 mile round trip walk to the lower cliff dwelling is a paved trail that rises 350 feet. There are benches along the way.. and folks of moderate exercise ability should be able to complete that 1-mile round trip in about an hour. 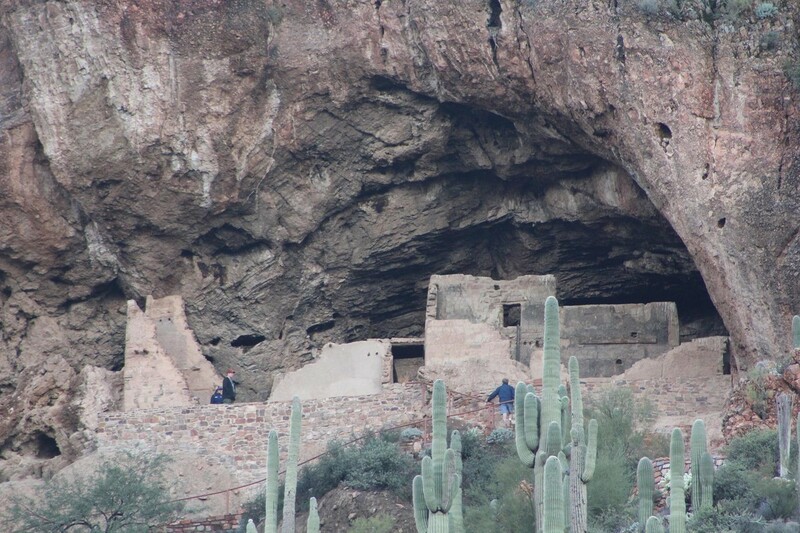 If you walk to the upper cliff dwelling ruin (which is double the size of the lower ruin) it’s 3-4 hours round trip. They only conduct those tours November to April (because it gets too hot the rest of the year), and you need to be on a ranger led tour – weekends primarily and $5 per person. That trip is a longer walk – 3 to 4 hours round trip. It’s a beautiful place to visit – even if you don’t visit the upper ruins, the lower are still plenty to see and there is a museum at the bottom entrance. 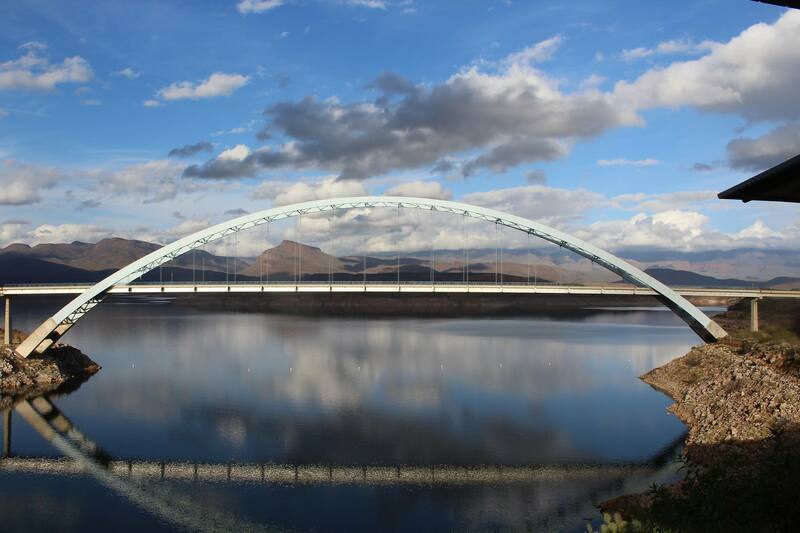 Bring your camera – because the views of the Roosevelt Dam are amazing! Since it’ll likely be dark soon after, you won’t want to take the Apache Trail back – here are some of the routes you can take. Take 87 N to Payson, hang a right on State HWY 88, and then go 39 miles to Tonto National Monument on the right. This is the ideal route for Scottsdale or Fountain Hills. Take US60 to Globe; then hang a left on State HWY 188; go 25 miles to Tonto National Monument on the left. Take 77 N. to Globe, and hang a left at HWY 60. After you pass through Globe, hang a right on State HWY 188 – the monument is 39 miles on the left. Take the US60 East to Idaho; head north to Apache Trail. Hang a right and go 15 miles to Canyon Lake, then past Tortilla Flats, and follow an additional 32 miles of [largely] unpaved, one-lane gravel, clutching the side of mountains and hairpin turns that drop 1,500 feet if not more. The route is not recommended for RV’s, or if you are in any type of a hurry. Did you like these ideas? If you did, don’t miss our previous posts, too!